Allavino introduces the all-new FlexCount Series of wine coolers, which have been specially designed to provide elegant and innovative storage for wine aficionados with diverse collections. Unlike other wine coolers on the market today, these coolers feature revolutionary new FlexCount Series shelving, which can accommodate bottles of all shapes and sizes without requiring you to remove shelves and drastically reduce your storage capacity. Not only does this side-by-side wine cooler give you the freedom to store standard size bottles right next to larger diameter bottles, but because it is made up of two single zone units, you have access to two independently controlled temperature zones that will allow you to store both red and white wine simultaneously!Each of this wine cooler's temperature zones can be individually monitored and adjusted using the two digital displays with easy-to-use push-button controls. 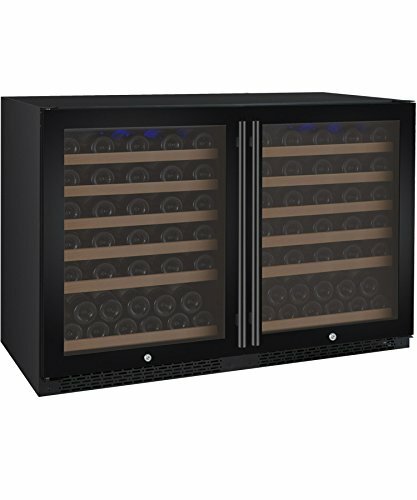 This wine cooler also features cool blue LED lighting that can be turned on or off with the push of a button.Effortlessly extend the 2X-VSWR56-1BWT's 12 shelves for easy access to up to 112 bottles. 10 shelves can hold up to 9 bottles each, while two bottom shelves can hold up to 11 bottles each.Enjoy worry-free storage for wine bottles of all shapes and sizes with Allavino's incredible new FlexCount shelves, which have a thin yet durable metal construction that resists sagging and maximizes your available storage space.Their quiet, vibration-free performance and 25% more energy efficient design makes these Allavino FlexCount wine coolers a perfect fit for your home!These FlexCount series coolers feature a beautiful finished cabinet and convenient front-venting design that give you the option to use them as freestanding units or build them into your cabinetry for a seamless look. 112 BOTTLE CAPACITY: This wine cooler features 10 shelves that can hold up to 9 bottles each and two bottom shelves that can hold up to 11 bottles each for a maximum bottle capacity of 112 bottles. The maximum capacity can be reached with many different bottle sizes and is only affected when adding in larger Pinot or Champagne bottles, making it an excellent storage option for wine lovers with large and diverse collections. DUAL ZONE DIGITAL TEMPERATURE CONTROL: Quickly and easily monitor and adjust the temperature in each zone individually using the intuitive control panels with clear digital displays and user-friendly push button controls. Both zones can be set between 41 degrees Fahrenheit and 64 degrees Fahrenheit to store red, white, or sparkling wine. The control panel can also be used to turn on the cool blue LED lighting, illuminating the interior without the heat of standard incandescent bulbs. INNOVATIVE NEW SHELF DESIGN: Featuring a thin yet durable metal construction, Allavino's unique FlexCount shelves are strong enough to support the weight of bulk storage without sagging while maximizing your available storage space to accommodate larger diameter bottles. Each shelf is installed on ball-bearing tracks and extends smoothly for easy access to every bottle, and wooden slats gently cradle each bottle to help prevent harmful vibration from affecting your wine. BUILT-IN VERSATILITY: Allavino's FlexCount Series wine cellars incorporate a cutting-edge design that brings style and convenience to any environment. They have a front-venting construction that allows them to be built-in to cabinetry for a seamless look, as well as fully finished cabinets that make them elegant freestanding additions to nearly any room in your home. Each unit comes with both towel bar and curved handles for a custom look that fits in with the surrounding decor. SIDE-BY-SIDE DESIGN: This Allavino FlexCount Series 112 Bottle Dual Zone Wine Cooler is made up of two single-zone 56 bottle wine refrigerators with opposite hinged doors. Each unit has its own separate power cord and is controlled using its own control panel with digital display and push-button controls. When placed side by side, the combined unit measures 33.9" H x 46.8" W x 23.6" D and stores up to 112 wine bottles. If you have any questions about this product by Allavino, contact us by completing and submitting the form below. If you are looking for a specif part number, please include it with your message.